Douglas Farrago’s bimonthly collection of top-ten lists, editorials and “True Stories of Medicine” provides a sharp satire of the health care system. In 2001, Douglas Farrago launched Placebo Journal, an unabashedly silly—often sophomoric—but consistently hilarious compendium of parodies of the U.S. health care system. A decade later, the bimonthly publication—called by Farrago, a primary care physician in Auburn, Maine, “the only medical journal that will make you laugh…on purpose”—has 10,000 paying subscribers. Flush with that success, the entrepreneurial Farrago (his “Knee Saver” device is worn by pro baseball catchers) has branched out with a blog, an e-newsletter and Webcasts, and currently he’s working on a concept for a reality television show. Beneath the humor, Farrago insists, is a serious purpose: shedding light on a health care system that too often fails patients and mires physicians in red tape. Q: Where did the idea for Placebo Journal come from? A: After practicing for several years, I realized that what kept me going was walks with my partners after work, sharing war stories, decompressing and laughing. Placebo Journal was a way to extend that conversation to a wider audience. My view is, if I can’t change the frustrating aspects of medicine, at least I can poke fun at them. Q: Did you always want to be a humorist? A: I’ve certainly gotten into trouble my whole life for being a wiseass. Q: The Journal directs its sharpest digs at managed care—for example, the Managed Care Executive Word Find contains names of actual executives along with terms like Satan, looter and unethical. A: Those words may or may not be related. Q: What’s so bad about managed care executives? A: Why do we need them? They are middlemen with way too much say in how and when people get treated. What if everybody had high deductibles and paid cash for service? People would shop around for the best colonoscopy at the lowest price. There would be no delay of payment, no billing problems, no fighting over coding. Q: Also among the Journal’s favorite targets are drug and medical device ads. You've created spoofs such as “Oxycotton Candy,” which “melts in your mouth, not in your nose,” and designer vaginal prolapse devices for fashion- conscious women. A: I don’t dislike drug companies. We need their products, and they need to make a profit. But how can you resist making fun of their creating the impression that all your problems will go away if you take a pill? Q: Does the magazine support itself financially without advertisements? A: Yes, thanks to our 10,000 subscribers. Besides, if we took advertisements, how would you know the real ones from the fake ones? A: Bureaucracy is absolutely destructive to this job. When the ratio is five administrators for every doctor, that’s insanity. The alphabet soup of HIPAA and “quality initiatives” and endless forms all get in the way of my sitting down with a patient and asking, “What’s going on?” If I have to fill out “quality indicators” before I can talk to a patient who is sitting in my office in tears, thinking about suicide, there’s something wrong with the system. That’s why doctors quit. Q: You offer anonymous but true stories of patients, such as one who claimed to drink no alcohol, only beer (two cases a day), and another with countless piercings who refused allergy treatment for fear of needles. Is Placebo Journal reading material in your waiting room? A: We poke fun at every aspect of medicine, and that naturally includes doctors and patients along with administrators. But I don’t want my patients to think I’m writing about them—I’ve never put a story about one of my patients in Placebo Journal. Anecdotes from other physicians are completely anonymous and masked. 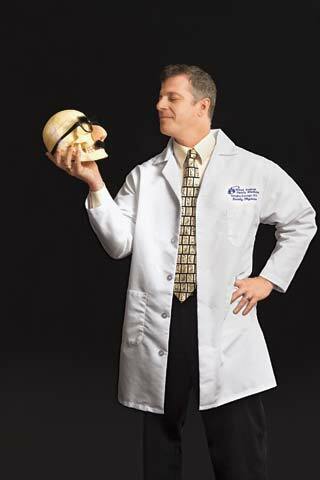 Q: If Placebo Journal is the Mad Magazine of medicine, would your TV show be the Monty Python? A: If the show happens—I’m working with two producers who are speaking to three production companies—we hope it would be fun, but it wouldn’t be a parody. I would travel around the country to show what primary care is like in the trenches and to visit patients in their homes. It’s too easy to judge a patient based on 15 minutes in the office, without seeing his or her broader life. We want to show the positive side of primary care. There’s a desperate need for primary care doctors, but nobody wants to go into the field. We’d show how much these people are appreciated and needed by their communities. As host, my job would be to keep things fun by including those lighter, human moments that keep you going. Homeless patients suffer multiple afflictions that most doctors never see. Innovative programs are reaching and helping them. Leaders of the Boston Health Care for the Homeless Program discuss the challenges of treating this special population.